My great grandfather was a blacksmith and carriage maker on Mill Street in Acton during the mid-nineteenth century. He was born on the family farm in 1835 and later moved to the village to run his carriage business. The original farm was settled by his father Henry in about 1835 and was just northeast of the town. It is apparent on the above map of 1877 as the property of his brother Thos. Rider. His parents, Henry Ryder and Mary Butler immigrated from Lambourne, Berkshire, England and settled as homesteaders on the farmland mentioned above. Henry and his wife had eleven children during their union; George 1829, David 1831, Ann 1833, James 1835, Marie Elizabeth 1839, William 1841, John Thomas 1842, Amelia 1846, Mary Jane 1848 Thomas Edgar 1850, and Hiram 1853. Of those eleven children, four of them would marry Swackhammers, my great grandfather among them. The need for blacksmiths in the mid 1800’s was definitely present. Usually the families were large as was my great-grandfathers and the family farm would usually go to the oldest male in the family. Therefore other sons had to find their own farm or some other means of employ. Blacksmithing was one of the trades and a good “smithy” was worth his weight in gold. In 1854, four years before his marriage to Mary, at age nineteen, James formed a partnership with a Mr. Lightheart. James and his first wife Mary Priscillia Swackhammer were married at the Congregational Church in Georgetown November 11th 1858. In 1861 James and Mary were living in a frame Waterloo Wellesly Township with their one year old daughter Martha. James was employed as a blacksmith. He was 27 and Mary just 20. Before they would move back to Acton they would have their second child James William "Billy". Over the twelve years they were married, they had five children; Martha Matilda Priscilla 1859, James William “Billy” 1862, Emma Jane 1864, Mary Augusta 1866, and Jacob Henry 1868. In 1861 the partnership having been dissolved for more than seven years, he bought the business. Fire destroyed the shop in 1871 and a loss of $800 was incurred. Only $150 of the loss was covered by insurance. Mary died in 1872 and James remarried my great-grandmother Frances Sophia Martin when she was twenty-three. She was the eldest daughter of Mary Priscillia’s older sister Hannah. James was thirty-five at the time. These occurrences quite often happened in those days when one of the family became sick another would move in to care for them. Most often it was an unmarried cousin or sister. James married Frances November 11th, 1872, in Stewarttown, ten months after the death of his wife. Over the next thirteen years James and Frances had eight children; Thomas George1873, Hannah Elize Bertha Priscilla 1875, Frederick Earnest 1877, Edward Darling 1878, Ida May 1880, Alice Maude 1881 (my grandmother), Laura Beatrice 1883 and David Nelson 1885. James rebuilt and continued on in the trade with brother-in-law Wm. Grant for a short time. He built a workshop in 1874 and an addition to it in 1875. They turned out sixty rigs in that year, most being top quality light carriages and some considered very stylish. He also made twenty sleighs or cutters as they were called for that winter season, of which most were presold. It appeared that the business was growing by leaps and bounds and was becoming one of the most extensive and important industries in the town. His superior class of work spoke for itself in the success of his trade. In 1875 James father Henry, died and left him $50 in his will. “In 1876 several families of Congregationalists decided to build a church in Acton. James Ryder led the Cameron, Armstrong, Zimmerman and Dempsy families in their split from Churchill to for an Acton congregation. The Beautiful brick church was opened in July 1877 at a cost of $8000. RevIves of New York, who had preached the year before at the opening of the Methodist Church on Mill Street was invited to preach with the objective of raising the total cost through pledges. He worked hard since he preached for five hours before the total cost was pledged. By 1877, James was considered an extremely successful tradesman in the town of Acton. James factory and house were completely destroyed by fire in March 15th, 1878 according to an article in the town newspaper March 21st. It was believed that the fire was intentionally. On Friday morning March 15th at two o’clock a.m. the house and carriage works of James Ryder, corner of Mill and Elgin was afire. The Congregational church bell (of whom James was a loyal member and leader), was sounded and in a short time a large crowd of villagers helped to quell the blaze. Unfortunately, there was no fire engine in the town and the efforts of trying to put out a large fire with pails of water was in vain. The attempt to save the two story frame work shop, failed so the crowd directed their efforts toward saving the house, situated right next to the shop. Unfortunately the heat from the blaze forced them to give up hope and the house also burned to the ground. The fire was so intense that many of the other houses and outbuildings in the vicinity came close to catching fire as well. Mr. William Masales’ home just opposite the Ryder house caught fire several times but the crowd was able to extinguish it. His house was however charred on one side due to the heat of the fire. Very little was saved from the factory but the family and friends were able to almost clear the house of its contents albeit in a damaged state. Two of James employees David Smith another brother-in-law and John Barber both lost their tools valued ad $150 each which were not insured. Mr. Ryder’s books, notes and a sum of money were consumed in the office where the fire is said to have started. This was a great blow to the family as the losses occurred in the fire were close to $15000 and the businessman was only insured for $3500. One wonders why after suffering a fire with little insurance just ten years before, that James would not have taken better insurance. Perhaps the rapid growth of the business caused him to overlook it. His staff was willing to help clear off the burnt timber, and he has commenced the erection of a temporary shop. His plans were to rebuild a larger plant for an ever-expanding business, which would have been welcomed in Acton. During the next year James posted ads in the local newspaper to try to rebuild his business. The economy must not have been as strong at that time as indicated in his notices and it would seem that he had some difficulty in collecting some of his accounts. His advertisement shows his honesty and integrity but unfortunately that was not enough to save him. In January of 1879 due to the trouble with the fire James Ryder became insolvent and was forced to close shop. Whether or not people made good their debts is unknown. But the loss of nearly $12000 in the previous year forced him into bankruptcy. There had been some rumblings and bad feelings between some of the Congregational congregation and one wonders if possibly there was ploy to get rid of the man who caused the split. 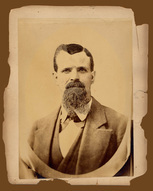 Before April of 1879 James Ryder moved to Petrolia to start anew. New members did not flock to the new church, once James left Acton and the pledges were not met. Dr. McCullough, who held the mortgage, foreclosed. The church was offered for sale in 1881. It was sold to the Catholics and became St. Joseph's Church. (Acton's Early Days. page 20). This is the funeral card sent out when my great grandfather James Ryder was laid to rest. 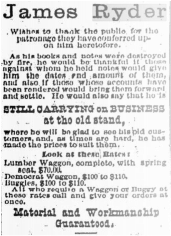 James died in Petrolia on March 26th 1886 and his death was published in the Halton's Historical and Newspaper Records. Death of a former resident. 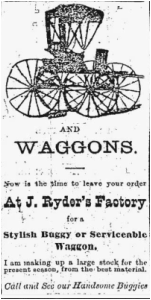 On Saturday last the sad news of the death of Mr. James Ryder, Carriage Manufacturer and Blacksmith, of Petrolia, for many years a resident ofActon, was received. It seems that a couple of weeks previously Mr. Ryder accidently struck his knee against an anvil. The wound was at first treated indifferently but inflammation set in and blood poisoning ensued and in a few days life departed. The corpse was brought to Acton on Saturday evening, and the funeral took place on Sunday afternoon from the residence of Mr. Thomas Ryder, deceased's boyhood's home, to Church Hill Cemetery. After his death Frances moved back to Acton to continue raising her children. "The Congregationalists at Churchill had decided to move into Acton to attract more members in 1876. They built a large, ornamental brick church in town. Only the Methodist church was brick at that time. However, the new members did not materialize and some of the old members could not pay the money they had pledged. By about 1880, they were forced to return to Churchill. They sold the church to the Salvation Army who had similar financial difficulties, and the new church went up for sale. While most Catholics still resided at Dublin, there were 33 Catholics in Acton by 1881 according to census records."